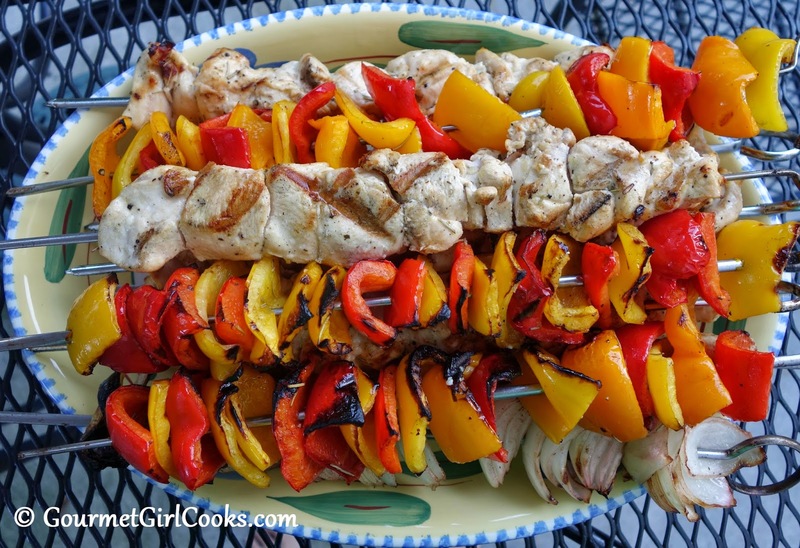 Gourmet Girl Cooks: Grilled Chicken Kabobs & Happy Autumn! First of all...Happy Autumn! I am so excited that at 10:29 p.m. tonight, fall officially begins. I'm looking forward to cool crisp days and chilly nights. This weekend was busy. We celebrated my oldest son's birthday yesterday and it was a wonderful day. He is one of the kindest, most generous hearted people I know and I am very proud to call him my son! I am so fortunate to be the mother of 3 of the most amazing kids who have grown to be exceptional young people. It's affirmation that I have done at least one thing right in my life in raising them. 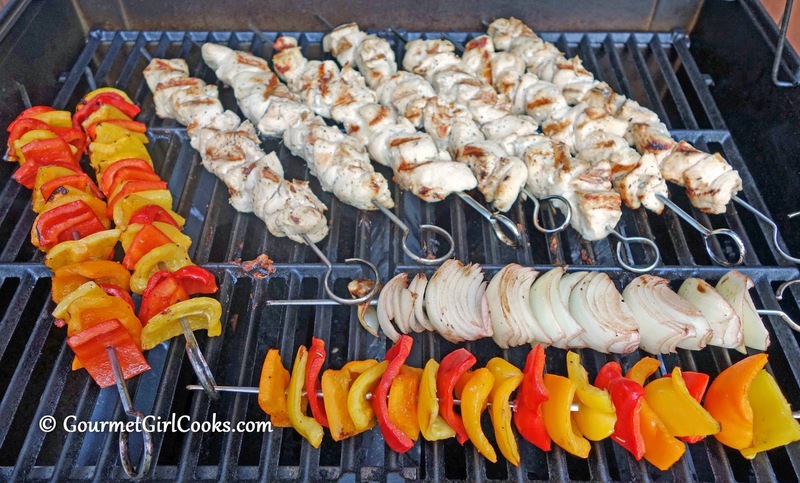 It was a beautiful day yesterday and I made one of our favorite grilled meals; Grilled Chicken Kabobs. I made a huge batch...I marinated 7 pounds of boneless chicken breast, 6 large colorful bell peppers, and 1 large sweet onion for about 8 hours. My marinade is simple and fresh using olive oil, fresh lemon juice, fresh minced garlic, fresh rosemary, Italian seasoning, sea salt and black pepper. By marinating most of the day, it produced the most tender, moist and flavorful chicken. The rest of the family enjoyed their kabobs over jasmine rice and I enjoyed mine "as is." 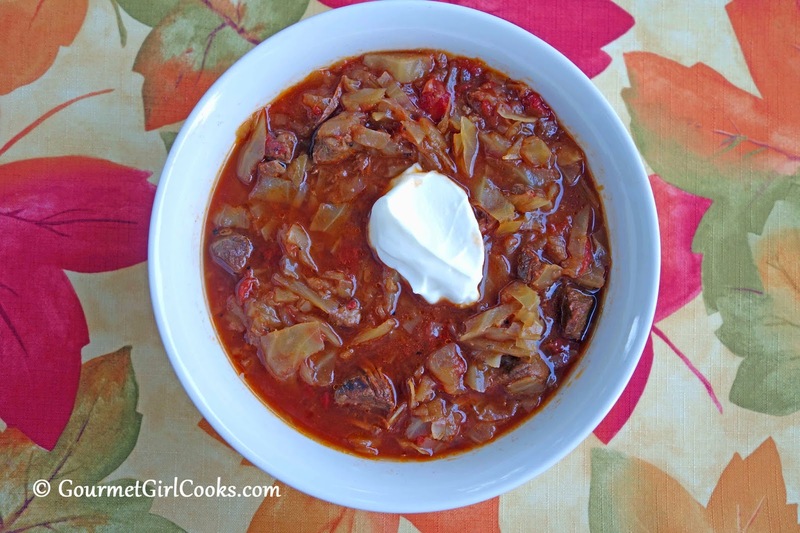 This evening we enjoyed the leftover Spicy Beef & Cabbage Soup. It was a perfect kick-off meal for the first day of fall. I decided to add a dollop of sour cream to my soup this evening...and it was amazing. 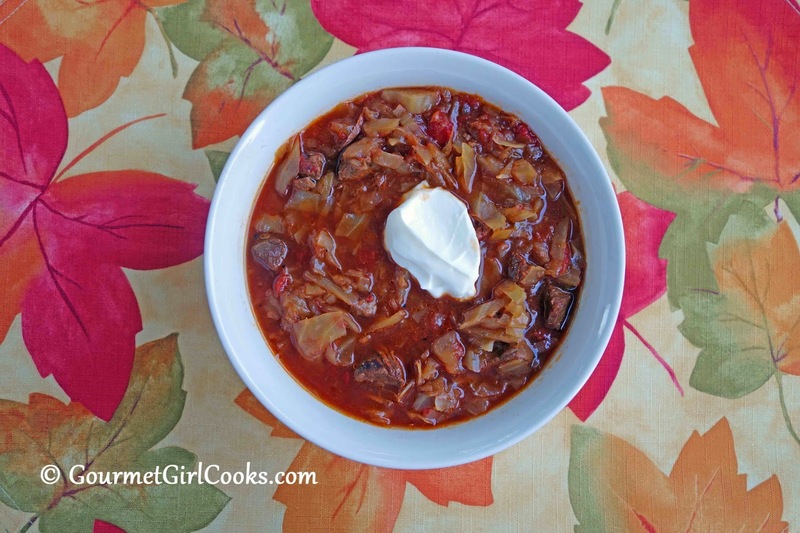 The sour cream went extremely well with the tomato, beef and cabbage flavors and it was a nice cool contrast to the hot and spicy soup. I snapped a few photos below of yesterday's birthday meal as well as tonight's soup. Enjoy! Well, it's officially Autumn! Yay! What a wonderful celebration you had with your family, too! 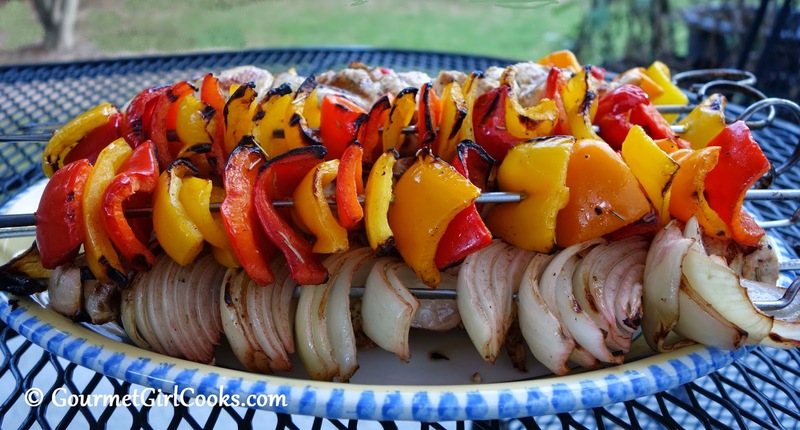 And the kabobs look marvelous! Thanks! For the first official morning of Autumn...we awoke to 55 degrees! It is cool and the air is fry and sky actually LOOKS like fall. If I weren't working today and afraid of looking like a complete fool...I'd be doing the "happy dance" for sure!